To eighteenth-century Britons, the ‘Glorious Revolution’ of 1688 and the Bill of Rights of 1689 were more than simple historical and political events. They were the foundations of British political stability, the guarantors of freedom from arbitrary rule. Under the form of constitution then established, no one, monarch or minister, could deprive you of life, freedom or property without proper legal process. In contrast to most other nations, the British enjoyed unprecedented freedom from interference in their lives on the basis of hereditary powers or prerogatives. Even the leading Continental intellectuals admired what they saw. Nowadays, we tend to think of constitutional arrangements as largely administrative. That was not the case in the Georgian Period. For a start, the Hanoverian monarchs owed their position to ways in which parliament dealt with the gap left by the death of Queen Anne, the last Stuart to reign over the country. In addition, there was a general belief that a nation’s constitutional arrangements more or less determined the way its citizens would live. Absolutist regimes, like the French kings, produced subservient people, dominated by authoritarian masters. In contrast, the British system ensured a proper balance between the powers of the executive (the monarch and his ministers) and the legislature (the parliament of Lords and Commons). By this means, Britain had grown into a nation of sturdy, self-reliant entrepreneurs and empire builders. In modern Britain, parliament and government are almost the same thing, to such an extent that most ministers have, by convention, to be selected from elected members of the House of Commons. A few may sit in the Lords, but these are either restricted to minor posts or to those directly concerned with the affairs of the upper chamber. The Government generally consists of the elected members of the majority party. Elected members of the next most successful party in the last election are designated as the Opposition. All other parties have little or no power, save when a close election produces a problem for the majority party in getting its legislation passed on a reliable basis. As so often, the USA has preserved the ideals of eighteenth-century British political thinking in its current arrangements; a practice no longer current in Britain itself. In the United States, the executive (President and office-holders) is entirely separate from the legislature (Congress), to the extent that service in the Executive does not require prior election, save for the President and Vice-President. Indeed, any person accepting a role in the Executive has first to resign from any elected office currently held. Here you have, in effect, the eighteenth-century constitutional monarch (The President) forming an Executive with his or her freely-chosen ministers. 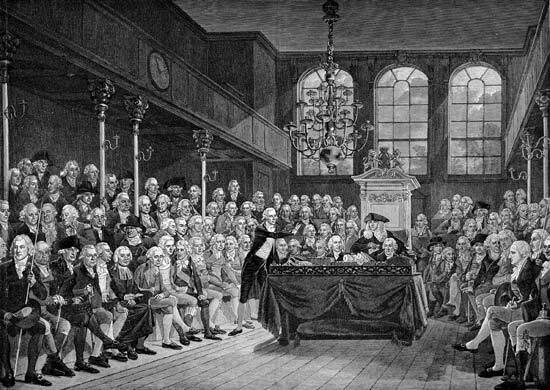 To balance their power, the constitution demands they must secure legislative acceptance of their programme via a Congress which is not only separate from the Executive (like the British parliament of the 1700s), but where party membership does not include any overt means to ensure that all party legislators must vote as the government requires. The Executive must persuade legislators to give their support. They cannot issue instructions, backed up by sanctions, as is the case in Britain. ‘Party’ is more about general support than reliable discipline in crucial votes. For many people in eighteenth-century Britain, independent parliamentary power was seen as the essential curb on government autocracy, not a means to facilitate it. Rather than providing an Opposition based on party allegiance, the constitution required that the House of Commons as a whole should act as the critical scrutineer of all government action. Government should not be certain of legislative support from a subservient group of party supporters. It should instead need constantly to win over the necessary voting majority from a House composed of independent-minded members with no need to fear reprisals to any refusal to give support when asked. Naturally, governments found this both uncomfortable and destructive of what they saw as stable and efficient executive action. Monarchs too disliked having to submit all their decisions to the critical view of several hundred elected representatives. They could not change the constitutional arrangements. What they could do – and did – was use patronage as a means to reward loyalty and discourage too much independence of thought: patronage principally in the form of the award of paid offices or via the payment of pensions. Their idea was to synchronise the executive and legislative aspects of government through a cadre of crown office-holders (placemen) who could be depended on to vote in the parliament, and solicit the votes of others, on behalf of the government. This issue of placemen and pensioners formed a crucial area of debate throughout the early and middle Georgian years. It was also an essential precursor to most later forms of Radicalism. What critics saw as ‘corruption’ through offering pensions or places, most governments of the time saw as aids to the efficient management of government business via steadfast ‘attachment’ to party. By arranging to have a suitable group of supporters in the Lords and Commons, the government could ensure that its legislation would be passed without delay or major amendment. If this support had to be ‘bought’ through the use of government or royal patronage, that was the nature of politics. Nothing actually stopped any member from voting according to his conscience. If he accepted some benefit in kind (place) or regular payment (pension) from the government of the day, neither was directly dependent on following the required pattern of voting. This dependency – or the lack of it – was in fact the heart of the matter. The ‘independents’ believed that any form of dependence on the monarch or the government bought by favours constituted corruption. Thus they wanted all placement (people holding positions with purely nominal duties, but generous payment) and pensioners (people in receipt of annual payments from the monarch) banned from the House altogether, rather as today’s US congressmen or senators are prevented from holding executive office. They also wanted more frequent elections to parliament. If members had to be re-elected annually, or at the most every three years, that left less time for the government to build up steady support through the granting of favours. The ‘independents’ also labelled cabinet government as corruption, seeing its meetings as ‘midnight councils’ aimed at usurping the ability of parliament to scrutinise and challenge government policies. Such secret cabals of vested interests were, they argued, unlawful under the terms of the laws that set up the post–1689 constitution. Decisions should be argued freely and taken openly, not agree behind locked doors by a group chosen by the prime minister of the day. Demands for reform and a return to the proper constitution of 1689 were set out many times during the 1700s. They were never successful. In part, this was because the holders of executive power saw them as a significant threat to being able to transact any government business at all. In part, it was simple human nature. Those who gained by the process had no wish to see it abolished. The later Radicals were no more keen on the application of patronage to politics than the earlier ‘independents’. Where they differed was in their approach to dependency. What the ‘independents’ claimed were limitations on open argument, they denounced as the means whereby the country was ruled by a self-appointed elite based on wealth and privilege. The ‘independents’ had an essentially representative view of parliament. They wanted individual members to be true representatives of the electors; men chosen on the basis of their suitability to exercise their unfettered judgement in the interests of the nation. Whether the franchise was wide or limited, election should be about those fittest to vote choosing those fittest to exercise rational choice. For the Radicals, the matter of dependency was central. They wanted elections to be based on a universal (male) franchise (to undermine elites and vested interests) and those elected to see themselves more as delegates, required to use their votes in parliament directly in the interests of those who sent them there. From about 1780 onwards, constitutional arguments were dominated by grand issues like republicanism versus monarchy and privilege versus the rights of ordinary citizens. More minor questions, such as the freedom of individual MPs to vote according to conscience, became lost in the fog of battle. Britain never had another revolution along the lines of the the French or American model. Though some reform was achieved, the status quo was ultimately the basis for our modern constitution. Because of this, political parties in the 19th century became the principal tools to endure stable and efficient government, developing the whole paraphernalia of patronage, obligations and sanctions that they carry today. Arguments about freedom of conscience were simply ignored as being naive and idealistic. Perhaps it’s ironic, therefore, that exactly these questions are being resurrected in Britain today in the context of the referendum to be held on EU membership – even to the extent of calling into question the convenient doctrine of collective cabinet responsibility. Even 21st-century governments, it seems, fear to trust either MPs or their constituents to make the ‘right’ choices on matters of national interest. I’d be interested to know what you think about Britain’s EU membership. And there were a lot of things you discussed that seem to be where the US is currently heading. Sorry, I’m a conservative! People should never need to apologise for their personal opinions. My own, however, are not something I think relevant to this site. All I was doing in this post was drawing attention to parallels in current times. Which you did, magnificently. Conservative is a dirty word in the area where I live. I used to be a flaming liberal, but you know what is said: If you’re young a not liberal, you have no heart; if you’re old and not conservative, you have no brain, Or something like that!